Well well well, aren’t we getting adventurous? These Swanky Little Millet Idlis have no rice at all, not that we don’t love rice, but if you were looking for ways to eat more millets (aren’t we all?) I can’t say enough about సామలు known in English as Little Millet and in Punjabi as Swank. Yes, Swank. So here are the names in various languages – check if your store has them so that you can get your swank on! Little Idlis made of Little Millet and Urad. The idlis are very easy to prepare. Note that the grey color comes from the chilka (peel) of the urad and not from the millet which is an off-white or beige color. You can use the same batter to make dosas or uttappams. Dosas or idlis made with whole grain urad or urad dal will be grey in color. Instructions: Soak for 8 hours, add salt, grind, let rise for 8 hours or overnight, pour into idli plates and steam for 20 minutes on the stove or in a rice cooker. Step 1: Soak 1 part మినువులు (urad) and 2 parts సామలు (little millet). Wash grains prior to soaking so that you can use some of the soaking water while grinding. When the urad soaks it will burst through its skin. If you use urad dal the skin will separate. Do not drain it off. Use a sieve when washing the dal so as to retain the skin. Better yet wash the dal prior to soaking so that you need not wash it afterwards. The soaking water contains some of the nutrients from the bean plus those newly glamorous oligosaccharides also known as prebiotics – those things that help your body make helpful bacteria also known as probiotics. Soaked Urad – bursting out of its skin! Step 2: Grind the soaked millet and urad in a stone grinder, mixie or wet grinder. Add the salt and enough water to make a smooth batter. Below are pictures of the batter as it becomes smoother. The whir of the wet grinder transforming soaked millet and urad into idli batter. Step 3: Sleep. Yes! As you sleep the batter will rise. In 8 hours in a warm room it will double in bulk. Longer than that and it may become very spongy and somewhat sour but still good. If it is not very warm it may take 12 hours to rise but if it is cold then it may take up to 24 hours. Rather than wait for 24 hours, I prefer to keep the batter in a closed space like a box, cabinet or oven and put a pot of hot water nearby to keep the area warm. Idli batter made of sama (little millet) and urad (black gram) has risen overnight. Idli plates are filled with batter. Stack up the plates to put into the idli steamer. Aerial view of idli plates with sama idli (little millet idli) batter. 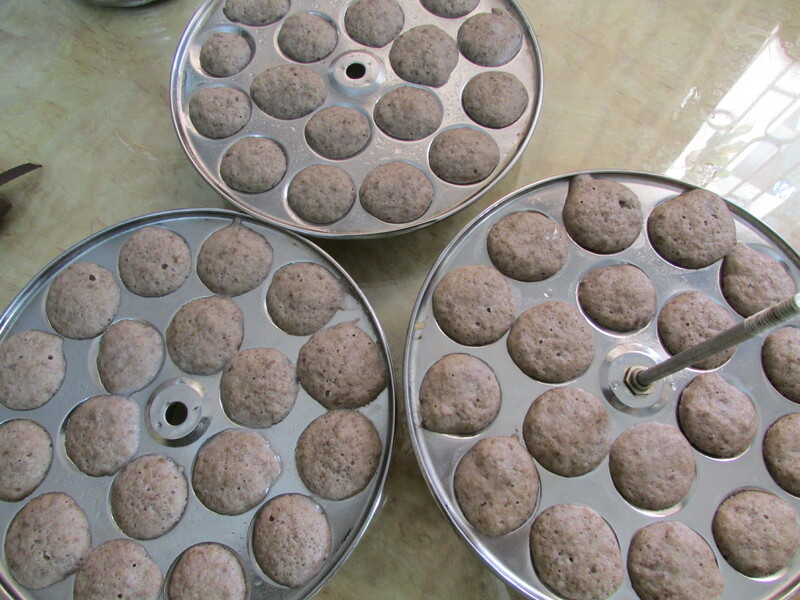 Aerial view of mini idli plates with sama idli (little millet idli) batter. You can also put idli plates into a rice cooker, pour water into the cooker vessel and cook. And the little little millet idlis are ready! So I hope you understand that I am calling these swanky in jest. Like so many millets and traditional foods, they are still grown in the remote rural areas, especially in forest and hillside villages and there they are actually inexpensive or free … in fact people are starting to forget them in favour of this fluffy white thing called polished rice and all manner of packaged powders and biscuits. In the cities it can be difficult to find many varieties of millets in the provision stores, but do ask, and encourage your local grocer to supply all kinds of millets. You can even show them this handy publication on Millets from the Deccan Development Society. Whole grain Idli – made with rice and urad. I just read this comment on someone’s blog. Can you please write a comment on it and where to get the unpolished ones or how to process it at home ourselves and how it was eaten unpolished traditionally? “In super markets you will get the branded/ certified millet products. Most of the companies sell only the polished millets as it looks white just like rice varieties. Eating polished millets does not provide any nutritional benefits. It is just like eating the polished rice. It happened to me once in Mumbai – I got Sama (little millet) and it turned out to be polished. I told the shopkeeper and next time they had whole grain sama, which I used with excellent results. Just tell the shopkeeper that you want the whole grain millet. to clarify what i wrote above, if possible if you can teach us how to process the millet at home so either husking it or handpounding it at home so we don’t need it machine processed we can do it ourselves. also it would help if you can show pictures of the millet polished and unpolished so we can tell the difference. and many are still not able to identify the varieties and pictures of each either unpolished or handpounded would help. we hear the terms handpounded and unpolished a lot but still don’t know what they look like. its hard to find pictures, especially pictures of handpounded. there is confusion between quinoa and millet which are totally different. corn and millet which are totally different. and thinai and panivaragu which are millets but different to each other but people mix the two up. please clarify this on the blog so people don’t buy the wrong thing which many are doing unknowingly. also readers should be careful not to buy mixes that are trying to slip corn, wheat, oats and quinoa into the millet mixes. these are totally different grains and some contain gluten so for those intolerant to gluten they should be careful. Regarding polished and unpolished I guess you can find photos on the internet but with experience you will become familiar with these just as you probably are with rice. It is not exactly what you requested, but an excellent resource none the less. in addition I’m told that the unpolished millet is something many people may not like because it might be more difficult to digest, they may not like its taste, most people are use to white rice so its an easier transition for them, they may not know how to cook and eat it properly so it digests well and if left unpolished insects will attack it or it will spoil faster. most blogs are only blogging on the polished type. in the future can you help educate us more on the unpolished ones and some of the concerns surrounding them. What can we make with Millet in the United States?